This is just more proof that there are beautiful things everywhere, and more and more of them are available to our eyes every day. Go look for them, and when you find them, share them. Cool, oh and BTW, for your love of things orange, check out Land’s End, orange seems to be a focus color for them for spring. Beautiful. I love how the ferns almost seem like shadows in the forest..
Keep having those whims and sharing them with us! 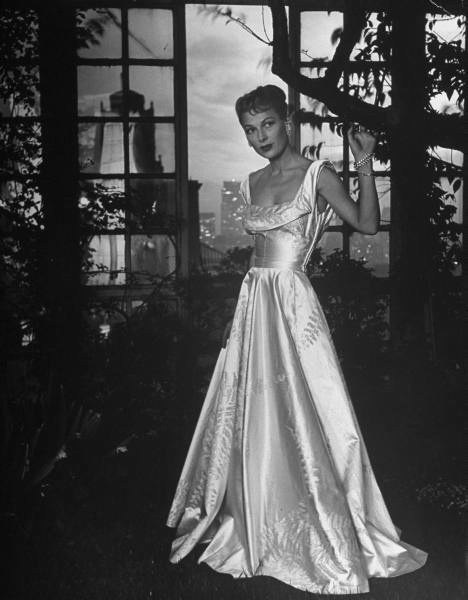 This is so beautiful, both the dress and her photography… thanks for sharing this as I had not heard of Nina Leen before, now I will explore her collection some more. Oh how I want one of my very own!!!! Oh my god that dress is beautiful. Thanks Erin. I so agree on “You know I’m a sucker for models who look as if they had a pretty decent idea of how a dress should be worn in real life, instead of just on the runway.” Well, I didn’t know, but I could have guessed it.The dress is lovely and the Google Life feature is even lovelier. The best thing about the Life archive is that you can look at both photos that were and were not published. As great as the picks are that made it onto the pages, I think it is a real treat to also see the ones that didn’t. Oh, Erin, that is truly beautiful. Thank you so much for sharing it with us. I realized that you can’t NOT make up stories about dresses. All you have to do is look and you have a story. And then you can develop it. That is an amazing talent. That dress is absolutely divine. Thanks for sharing! there are beautiful things everywhere, and more and more of them are available to our eyes every day. Go look for them, and when you find them, share them.I need to remember this and repeat it like a mantra. Plus you can buy these images! Framed!! Ah, the temptation . . . .
Erin, That is gorgeous! I am a huge fan of black and white imagery in fashion, this is a wonderful example. Thanks for sharing! I have a couple of Nina Leen books – her stunning photos, coupled with great quotes: Women Heroes and a Frog and Love, Sunrise and Elevated Apes, published in 1970 and 1974, respectively. Very cool books… I need to go dig those out of my stacks. Thanks for the reminder! When I saw this post’s heading “Just Because,” I thought you were going to write about Modess ads from the 50s and 60s. Are you old enough to have seen them? A picture of a woman in an extravagant dress with the caption: Modess, because . . .. Actually, I’ve been intending to write about those ads, and I better get to it . . .Meanwhile, that dress is fabulous. No, definitely not Deborah Kerr. Just as beautiful, but not her. My cube mate says the perhaps the woman, rather than meeting her lover one last time, is on a cruise around the world, without her lover, and she is very happy about that. He was getting on her nerves, and she needs this opportunity to be alone, reflect, and reconnect with her inner goddess! Erin, thanks for the tip on this Life Magazine collection. Having public access to these photos is a great idea, but what idiot put them up without referencing the date of the issue and the designer’s name? I did a couple of searches, trying to find specific photos, with no luck. A search under “college, fashions, 1940s” will get the iconic front page photo showing Claire McCardell’s knit leggings outfits (but not her name or the issue date, sigh). I love the overlay on the bodice (at the neckline/bust area) very smart. I bet this dress made a wonderful noise as you strolled along. I can see the joy of leaving your fur wrap with the man at the door, the striding in, elegantly, into the restaurant and later, dancing in it’s joyous movement. Ha…I’m not the only one who enjoys those schmaltzy Modess ads (I’ve even purchased them from ebay with the intent of framing them for my teenage daughters bathroom…..they refuseed, how strange). When I look at this picture I hear schmaltzy music though, am I the only one who does that? This IS a wonderful photograph. The model reminds me of Joan Fontaine. Women really knew how to groom themselves and keep themselves fit to wear beautiful clothes back then, didn’t they?She’s so gorgeous and slim. The perfect dress for the perfect model. I love it! and wonder about the fabric, it is obviosuly silk, but what color, some pale neutral maybe. It’s just so beautiful. Thanks Erin, for bringing beauty into my world on an almost daily basis… I really needed soemthing lovely today, after watching hours of news footage about the horrible fires in my home state Victoria, Australia which have killed so many and left more with nothing. You have almost cheered me up. haha where would the world wide web be without google.. and that photograph is soooo amazing! im jealous and also on the dress. ZazzuI can say without doubt that she is wearing a corset–not that she was incredibly fit. If I was that GI, I’d desert. Incredibly fit? Well, she’s thin. Doesn’t look very muscular, so either thin came easily to her, or she worked at it, or both. But definitely thin. AND she’s wearing a corset. In those days, all women did that, even the thin ones, even the ones who had the ideal wasp waists naturally. And they wore them all the time; to refuse was a sign of being a lazy slattern who had given up on proper attire.I’m glad to live in the here and now, where the corsets are optional. They are a lot more fun when you’re not stuck with them for every day!